However, as time passed, I run into some details that I didn't agree with, and set out to change those. The overlays were sold at §30, but were mostly used for adding cracks, smudges and filth to walls... things that would normally LOWER the value of a lot. So I changed the price. I made them FREE. The overlays had a room score of 1. Now I had made them free, I didn't like them improving the environment for my sims. A smudge or crack wouldn't do that... So I removed the room score. As wall hangings, the overlays are considered art-work: sims will view them, comment on them, and approve or disapprove of them as if they were precious works of art! 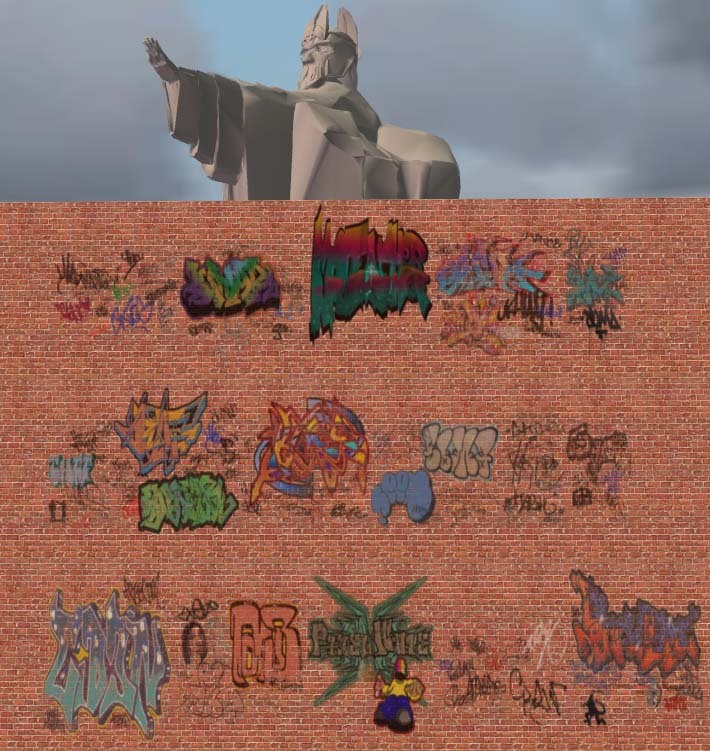 A damaged wall doesn't deserve such attention... So I found out how to disable that! I've relayed my findings to Pix, and found out that he actually agrees with me, and thinks these changes should be available to everyone. However, since he isn't presently in a position to make the changes, test stuff and publish them, he has allowed me to host them for the time being. So without further ado: here are updated versions of the 1-tile and 2-tile FullPost Wall Overlays, in separate files. For those who want to learn how to make such changes themselves: a wiki article is available here. Copyrights of this upload belong to Pixelhate, whom I thank for his original idea, and for his support in republishing this. Just because I'm me (and can't stand short, concise posts) I thought I would let anyone who hasn't seen them already know about CatherineTCJD at MTS who has used Pixwlhate's fullPoster overlay as the base for the "Great Wall Project", which makes all the Maxis walls (from all EPs) into "overlays" thereby letting you mix-n-match any boarder with any color/type of wall you want. You can find them all here in her MTS profile page. Also included are hiders for all the Maxis walls. The only *problem* is that if you are using a texture that covers the entire wall, doors & windows will *disappear* under them...but that only effects full-wall overlays, not the boarders. Yea, that would be related to this find from BO here? Must the original 'FullPoster Wall Overlays' be deleted to use these? Also, will all my recolors for his original files still work? Thank you for your help and thank you for sharing your work. You, especially, make my game more enjoyable.